Connie Hawkins shot three-point baskets there. David Bowie used the site for rehearsals. John F. Kennedy stopped by to campaign for president in 1960. Movies have been filmed there. And professional wrestlers have slugged it out at the Teaneck Armory. Currently, members of the New Jersey National Guard sleep there in between 12-hour shifts patrolling the George Washington Bridge. Completed in 1936 at a cost of nearly $1 million, the Teaneck Armory -- with its 37-foot-high arching roof -- has played a valuable role not just in the current war on terrorism, but also during peacetime. Sitting on 13.66 acres, the brick-and-stone structure was built by Depression-era laborers. They each spent only two days a week on the job because the government stretched the project to keep people employed as long as possible. "It took two years to complete," said Command Sgt. Maj. Richard Bammert of the National Guard's 50th Main Support Battalion. "They didn't want to rush it." Around the same time, New Jersey and New York built similar armories in Jersey City, Brooklyn, and elsewhere. Because armories tend to have vast floors, high ceilings, and few obstructions, many have become popular among filmmakers shooting indoor scenes. In recent years the Teaneck site has been in especially high demand because it's close to Manhattan, and its presence in a quiet residential neighborhood allows producers to make their films in relative peace. "There are things you can't find in Manhattan," said Helen Robin, line producer for Perdido Productions, Woody Allen's production company. The acclaimed filmmaker shot "Sweet and Lowdown," starring Sean Penn, at the Teaneck Armory. It was released in 1999. But the film industry was far from anyone's mind when the armory was erected for the 104th Engineers Battalion of the New Jersey Army National Guard, which provided emergency assistance during hurricanes, floods, storms, and bridge collapses. When members of the 104th were involved in World War II, the New Jersey Militia occupied the space. "The militia walked around neighborhoods, making sure people turned out their lights" to save energy, Bammert said. The 104th disbanded in 1993, and now the 50th, which is the state's largest guard unit and was formerly headquartered in Lodi, is based at the site. The unit includes about 1,000 people who have civilian jobs but train throughout the year in case they are needed to provide medical assistance, truck hauling, food service, or cargo handling in an emergency. Recently, guard members have been deployed to provide medical assistance to detectives at the Fresh Kills landfill in Staten Island, where the remains of the World Trade Center are being investigated. The battalion also operated a warehouse in Bayonne that stored donations for victims of the Sept. 11 attacks. Recently, the armory has also been used by soccer leagues that play indoors on an artificial grass rug. Over the years, the armory has fallen in and out of favor as a site for non-military events. It was especially busy through the 1960s. Auto racers drove midget cars inside at 110 mph. The Rev. Billy Graham visited. In 1938, 8,000 boxing fans saw 16 bouts in one night. In 1949, Gov. Alfred E. Driscoll allowed roller derby, and the Jersey Jolters beat the Washington Generals, 16-13, before a crowd of 4,000. The Harlem Globetrotters used their trademark basketball trickery to trounce the Philadelphia Sphas, 72-51, in a 1955 game. A 1957 article in The Record called the armory "Bergen's own Madison Square Garden," and focused on a dog show by the Kennel Club of Northern New Jersey. 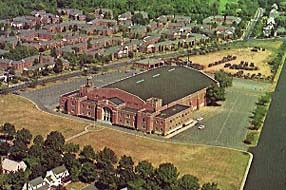 A turning point for the armory was in 1967-1968 when the New Jersey Americans, who would later become the Nets, played on the the 36,500-square-foot drill floor before crowds of just over 2,000 per game. The Americans were forced to forfeit a pivotal playoff game because a circus group rented the drill floor space that week and there was no other venue available. Teaneck Mayor Paul Ostrow said he has fond memories of the Americans, the American Basketball Association team that finished its only season in Teaneck with a record of 36 wins and 43 losses, tying for fourth place in the Eastern Division. Discounts allowed Teaneck school students to pay only $1 for tickets, and see visiting superstars such as Hawkins. Ostrow said he recalled the armory's custodians taping a three-point line to the drill floor prior to the games. The ABA popularized the three-point line, which was dismissed for years by the basketball establishment as a gimmick before it became a widely accepted part of the game at all levels. "It was so unique to have this high-class professional sports team that we could go see," said Ostrow, who was 16 when he attended Americans games. "The New York Knicks were too expensive and too far away." In 1968, the Americans moved to Long Island and changed their name to the New York Nets. That same year, Teaneck officials ordered a halt to non-military exhibitions, saying the lack of fire protection devices and safety exits made it unsafe for public assembly. That began a period of decline for the armory in which the structure deteriorated and was considered unsuitable for sports or entertainment. But starting in the late 1980s, the state changed its policy on the armory and again encouraged non-military exhibitions to take place, hoping the revenue generated in fees could be put back into the facility. The strategy worked, many believe. The state got enough money to install fire alarms, exit doors, and a new roof, and purchase new boilers to replace the building's inefficient heating system, Bammert said. Bowie's rehearsals for his 1990 tour were considered a sign of a revival. "We gave him a National Guard jacket that he wore on tour," said Bammert, who has been at the armory since 1972. In recent years, Mariah Carey rehearsed inside, and Woody Allen and others filmed there and turned classrooms into fitting rooms. Three years ago, indoor scenes from "You've Got Mail," starring Tom Hanks and Meg Ryan, were shot on the drill floor under the arching roof. Col. John Dwyer, a spokesman for the state Department of Military and Veteran Affairs, couldn't specify how much money the armory generates in leases to movie production companies, but said the amount is significant. He said a "good movie filmed there will pay the armory's utilities for an entire year." While the armory generates no tax revenue for the city, Ostrow said Teaneck officials now welcome its presence and do collect some permit fees. Ostrow said he anticipates the armory continuing to serve non-military functions. "In the 1990s, there was a resurgence in the use of it. It was like, hey, we're a part of the community. Let's open our doors," he said. The whistle blows, we're on our toes, shootin' baskets is our aim. We never, never give in, we're the Americans and we're out to win. Jersey Americans and we're out to win. I can't believe that more than 30 years have passed since that inaugural season. Unfortunately, I was a high school student without a car, and I was unable to make game trips to Teaneck. I learned, thanks to those radio broadcasts and sparse newspaper coverage, that Dan Anderson was the New Jersey center, and that the team included Levern Tart, Tony Jackson, and Bobby Lloyd. [July 1999 update from Frank Cardone] It took me thirty-two years, but I finally made it! In July 1999, personal business brought me to Teaneck for the very first time. How could I pass up the opportunity to visit an original ABA arena? 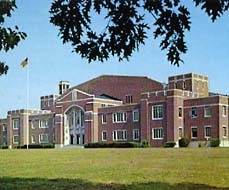 The Teaneck Armory is an impressive, fortress-like structure, with a surprisingly large amount of open space around it. The cornerstone reads 1936. The day of my visit, workers were cleaning up the "arena" portion of the building. One day earlier, workers had finished painting the ceiling (and its supporting metalwork) with an off-white color. One worker commented that the arena is now much brighter. Today, about ten rows of original stadium-type seating run along both sides of the arena, reaching down to the floor. The wall along the "front" side of the armory has about ten rows of similar seating, but these seats are "elevated," with the first row some fifteen feet above the floor. The opposite wall has no seating. Beyond that wall is the Armory's outdoor, rear storage area. I was informed by a NJ National Guard member/historian that the Armory now hosts a variety of events, including indoor soccer tournaments. Interestingly enough, it also is a favorite with Hollywood filmmakers. It seems that the large interior is ideal for movie sets. Recent movies filmed here include "You've Got Mail" and "Sleepy Hollow". The excellent HBO special about the ABA contains only about 15 seconds of footage from the Armory, with the Americans playing the Kentucky Colonels. Can Mr. Lawrence (whose memories also appear here) or another fan let us know how the ABA basketball floor was laid out within the "arena" space. The HBO footage shows large sections of bleacher-type seating. I am curious as to where the baskets were. Also, does ANYONE know the source of this game film? Is it a home movie? I would like to see this film in its entirety. I hope someone can direct me to its source. I couldn't make it to the Armory thirty-two years ago. This film would be the next best thing. I'll say this: based on this one visit to Teaneck, and what I have heard about Commack Arena, I can't help but wonder why Nets ownership (was it still Arthur Brown at that point?) abandoned Teaneck. The Armory was a far superior building, and Teaneck was a much better location. The tiny crowds that the Nets attracted at Commack verify this. Lastly, is there another original ABA arena still standing, or does the Teaneck Armory stand alone? I hope ABA fans who visit this site will respond to the above questions."